Rep. Jeb Hensarling said he would advance Rep. Ann Wagner's Retail Investor Protection Act to stop the Department of Labor's misguided fiduciary rule. House Financial Services Committee Chairman Jeb Hensarling, R-Texas, said in mid-September that he would advance Rep. Ann Wagner’s Retail Investor Protection Act to “stop” the Department of Labor’s “misguided” fiduciary rule and require the DOL to defer to the Securities and Exchange Commission’s “expertise” on fiduciary-related issues. Wagner, R-Mo., told reporters on a call the day before a Sept. 10 hearing was held by the House Financial Services Capital Markets and Oversight and Investigations Subcommittees that she wanted her bill marked up and passed by the full House Financial Services Committee by the end of September. The hearings, titled “Preserving Retirement Security and Investment Choices for All Americans,” discussed “how to handle” what Wagner said is “overreach” by the Obama administration and DOL. If everything goes as DOL plans, officials anticipate that Labor’s fiduciary rule will be finalized by May 2016. Wagner said on the call that while her bill could go straight to the full committee for a vote, the plan was to put it through a markup. Her bill, the Retail Investor Protection Act, which requires the DOL to hold off on issuing its fiduciary rule until the SEC issues its own fiduciary rule, has to secure enough Democratic votes on the committee, of which she’s a member, to be sent to the House floor for a vote. Wagner acknowledged that the “lobby” against her bill is “very tough,” citing opponents like Sen. Elizabeth Warren, D-Mass., as well as Labor Secretary Thomas Perez and the Obama administration. 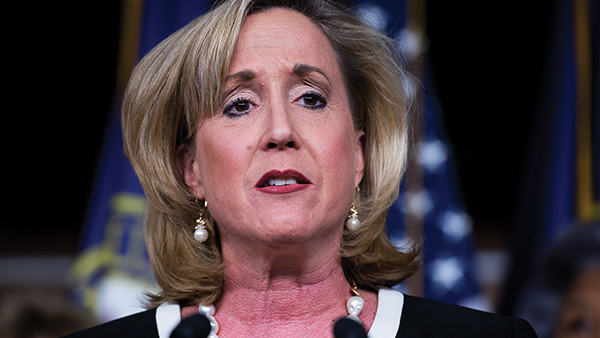 During the joint hearing held by the House Financial Services Capital Markets and Oversight and Investigations Subcommittees, Wagner argued that Perez is violating the Administrative Procedure Act (APA) by not reproposing the plan. She said the statements made to her in an Aug. 7 letter by Perez that DOL would issue a final rule — and not a reproposal — signals DOL is reluctant to revise its redraft to amend the definition of fiduciary under the Employee Retirement Income Security Act. “Based on that, it’s hard to imagine the DOL producing a workable rule based off of this proposal. The divide is just too wide between the two,” she stated on a call with reporters. She noted that Perez’s letter nixing a reproposal was sent to her before DOL held its hearings between Aug. 10 and Aug. 14 on the redraft. DOL took comments on the hearing transcripts until Sept. 24. The Administrative Procedure Act requires that an agency “must give notice of a proposed rulemaking, published in the Federal Register, and, after notice is given, solicit and accept public comments on the rule. Those comments will then be used in the agency’s analysis when promulgating a final rule,” the Coalition said. Perez has stated publicly that DOL is “flexible” and willing to listen to feedback on how to revise the rule. Rep. Earl Perlmutter, D-Colo., stated during the Sept. 10 hearing that he has spoken with Perez and that “DOL is willing to listen” to how its redraft needs to be changed. He noted that while he co-sponsored the 2013 version of Wagner’s bill, he couldn’t support the version Wagner reintroduced on Feb. 25. “That train has left the station,” he said. “I’ve been waiting for four years for the SEC to act” on its own fiduciary rulemaking.